Kate Middleton has been showing off some beautiful outfit choices. | HELLO! The Duchess of Cambridge, née Kate Middleton, has only been on royal tour for a couple of days, but, as usual, people are already going crazy for her style. 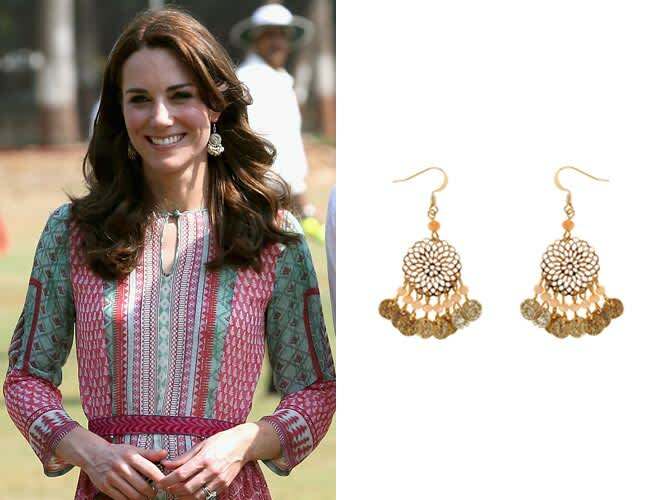 During a cricket match in Mumbai, Kate, 34, opted for a gorgeous dress by a local designer. Anita Dongre first showed it at the most recent Lakme Fashion Week, and confessed The Duchess and her PA/stylist Natasha Archer took the Gulrukh dress and made it their own. Speaking to The Telegraph, Anita explained: "In India a lot of women would wear this with trousers and a stole. Her stylist has taken part of the stole and converted part of that into the belt and chopped it off so it can be worn as a dress. She's amazing – it looks easy, breezy and so contemporary." You can get your hands on Kate's beautiful dress on Anita's official website for just over £165 – but there is a two week waiting list. But The Duchess also gave a nod to British designers with her shoes and accessories. Her sparkling earrings are from Accessorize, and a steal at £8, while you can get her cute taupe wedges for £45 from Monsoon. Revealing how Kate decided on the dress, Anita continued: "Her stylist emailed us and we sent her a look book, then she came in and got some pieces for fittings." But Anita didn't find out whether or not her designs had made the cut until the rest of the world, and was 'delighted' when she saw The Duchess in her dress.